This is a Script version Chevrolet Derby cap with 7 inch back inside diameter. These authentic Chevrolet center caps feature the “Chevrolet Motor Division” script. These Script version Chevy center caps fits our Corvette/Camaro Rallye wheels, all sizes, Smoothie wheels 16" and 17" only. Please check your actual wheels required cap fitment size. 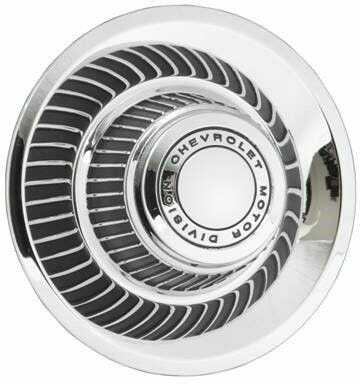 Will this cap fit the 15x8 Pickup Rallye | 6x5.5" bolt | 4.00" backspace | Chrome finish? Yes, the 7 inch back diameter caps for Chevy Rallye wheels also fit the Pickup Rallye wheels. I own a 1972 Corvette. It came with factory Rally Wheels with the Derby Cap and Script. I need to replace a lost center hub. Please advise the hub I need to order. We would like more information in order to advise you regarding your question. Please contact us at 1-800-251-6336, or support@coker.com.